Pest description and damage The ash borer, also known as the lilac borer, is a clearwing moth that attacks ash as well as lilac, privet and other members of the olive family. The adult moth resembles a paper wasp, with orange and yellowish markings on a black body. A thin wet stain is followed by a mix of frass and sap. Areas around the entry site may become sunken, and frass and sawdust may accumulate around the base of plants. Eventually, plants show branch dieback, weaken or die. For biology and life history Adult clearwing moths emerge in spring from a round hole at the top of their gallery. They mate and lay eggs on the bark at the base of plants and the young larvae tunnel under the bark. Pest monitoring Deploy pheromone traps in spring to determine when the moths emerge. Watch for wet sunken areas in the bark at the base of the tree/bush. Often the pupal case will still protrude from the exit hole indicating adult emergence. Spotting even old damage will provide some indication of how heavy the infestation is and inform the next season's strategy. Pheromone traps are available for this pest and will attract males to the trap preventing males from reaching females. Properly prune out infested branches during fall or winter when moths are not active as the moths often seek out injured areas on the bark. Do not compost as moths may still emerge. 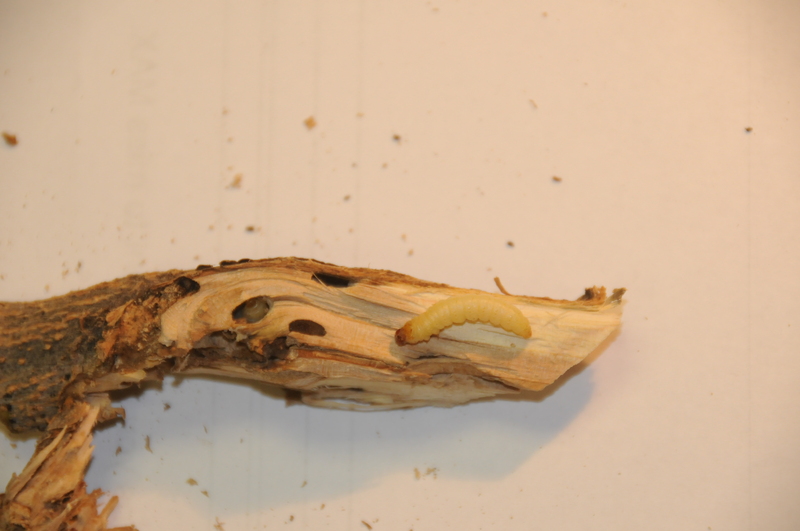 Insert a knife or wire into the borer hole to kill larvae and pupae. Prune properly for a faster sealing wound. Entomopathogenic nematodes are available. They are to be sprayed at the base of trees near entry wounds so the nematodes can find their way into the galleries.